Not to be confused with Eiffel (disambiguation). The Eifel (Luxembourgish: Äifel) is a low mountain range in western Germany and eastern Belgium. 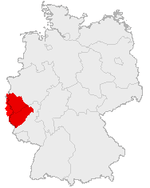 It occupies parts of southwestern North Rhine-Westphalia, northwestern Rhineland-Palatinate and the south of the German-speaking Community of Belgium. The rivers draining into the Moselle, Rhine and Meuse, such as the Our, Kyll, Ahr, Brohl and Rur, have cut deep into the edge of the Eifel and formed larger valleys. 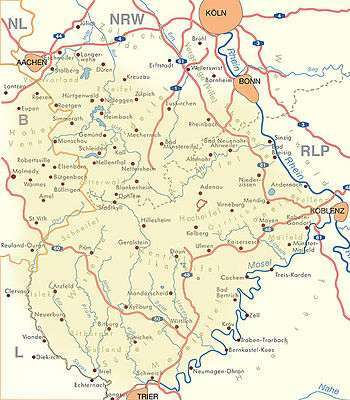 The northernmost parts are called North Eifel ("Nordeifel") including Rur Eifel the origin of the river Rur, High Fens ("Hohes Venn") and the Limestone Eifel ("Kalkeifel"). 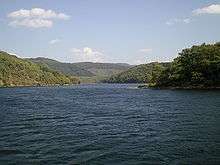 Due to its moist and mild Atlantic climate, the Eifel bisected by numerous streams and small rivers. 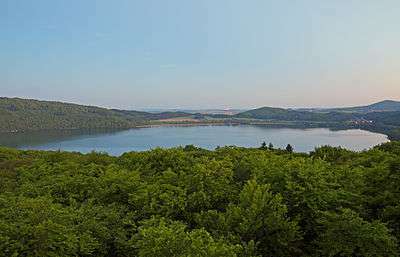 Impoundment of these streams, especially in the North Eifel has led to the creation of very large reservoir, such as the Rursee, which is the second largest in Germany by volume, and the Urftsee. The Eifel and its western continuation into Belgium, the Ardennes, are a part of the Variscan mountain belt and belong to the Rhenish Massif (Rheinisches Schiefergebirge). The Eifel consists mainly of Devonian slates, sandstones and limestones, laid down in an ocean south of the Old Red Continent and folded and overthrust in the Variscan orogeny. 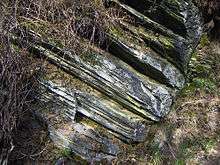 The Eifel geological structures like main folds and overthrusts can be traced in a SW-NE direction far beyond the Rhine valley. In the Tertiary and Quaternary geological eras, the Eifel was a site of extensive volcanic activity. Some of the hills are volcanic vents. The peculiar circle-shaped lakes (maars) of the volcanic regions formed in volcanic craters. The last volcanic eruptions in the Laacher See volcanic site took place around 10,000 years ago and generated a huge volume of volcanic ash, now found in thin ash layers in contemporaneous sediments throughout Europe. 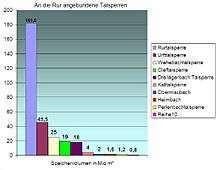 The volcanism of the Eifel is thought to be partly caused by the Eifel hotspot, a place where hot material from deep in the mantle rises to the surface, and partly by melt-ascent at deep fractures in the Earth's crust. Research has shown that the volcanism is still active; the Eifel region is rising by 1–2 mm per year. Historically, the Eifel volcanoes had inactive phases of 10,000 to 20,000 years between active phases, suggesting there is a possibility of future eruptions. 1 2 Elkins, T.H. (1972). Germany (3rd ed.). London: Chatto & Windus, 1972. ASIN B0011Z9KJA. "Eifel". Encyclopædia Britannica. 9 (11th ed.). 1911.